You haul 16 tons and what do you get? Radiation poisoning and blown up, most likely. The Miner is a special engineering role that starts in the Mining Department and braves the void of Space (or the depths of the Trench on Oshan) to procure ore for the station. With their easy and reliable access to plentiful amounts of ore, they make also great blacksmiths and craftspeople and are often enlisted for deep-space expeditions into the Debris Field, Mining Level, and beyond. 3 Sturdy Metal, High Energy Conductor?! Help! 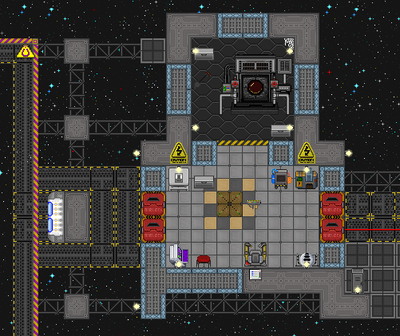 Being a miner is a mostly solitary job amidst cold space, but a skillful mining shift can be of enormous benefit to the station, gathering precious ores by the hundreds. Quartermasters, roboticists, and mechanics will always be thankful for the proper materials for their job, and people using the public arc smelter will be besides themselves with excitement when you bring them cool, new materials. You also get a Quantum Telescope in your department so you pull in particularly mineral-rich asteroids. Expect the Research team to come knocking at your door to use so they can configure the long-range teleporter and go to all the cool hip locations. say :e I'm gonna use a mining charge, watch out! Note: In any case, the majority of ore and gems won't be usable in the mining fabricator unless you process them with a portable reclaimer or material processor first. Not everything should be immediately processed, though; sometimes, it's better to leave it raw for the Quartermaster to sell. Check out the Guide to Mining for more info. The mineral magnet right below your workplace. 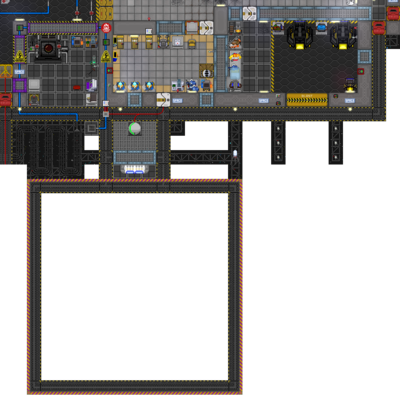 The mineral magnet, just a short walk (or conveyor ride) east of your spawn room. The magnet below the ship. Watch out for engine fires! The mineral magnet next door. The mineral magnet, just a short trek westward on the catwalk. 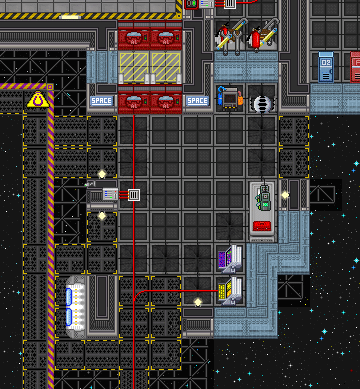 On most stations, you bring the ore to you rather than bring yourself to the ore; that is, you pull mineral-bearing asteroids (and occasionally wrecks) into the Mining Department with the mineral magnet and harvest the ores contained within. Not only is it safe, reliable, and easy to use, but it also means you're closer to both the people who directly benefit from your work and the people who can save you when you're hurting, burnt, and mildly radioactive. A space suit, most likely an engineering suit and helmet set from the rack. A jetpack from the rack. (goes on your back). A mining belt from the Miner equipment lockers (goes on your waist). Meson Goggles from the Miner equipment lockers (goes on your eyes). Other essential equipment includes ore satchels, an ore scoop, concussive charges, a geological scanner and a powered pickaxe. You can take whichever of these you will need and put them in your pockets or the mining belt. Make sure you have a breath mask (or equivalent) on too, so you can actually link up with the air supply in your jetpack. To turn internals and start breathing in the oxygen in your jetpack so you don't asphyxiate, click on the Toggle tank valve icon on the top left. 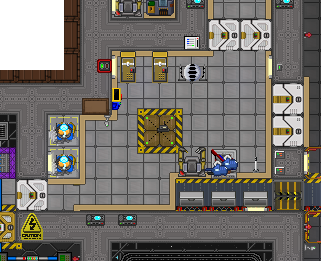 You might also want to claim a mining pod and upgrade it with better sensors, ore scoop, and magnet link array. Though you won't be able to mine rocks until you get a hold of some plasmastone for plasma cutters, you'll collect ore astonishingly quickly, especially if you have the other miners break rocks while you scoop up the ores. All set? Great! 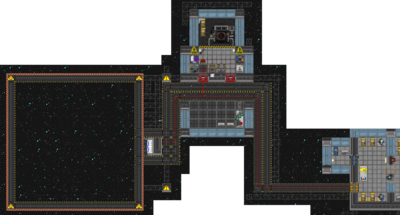 Exit the airlocks, take a short walk on the catwalks, and find the mineral magnet's control terminal (it's often in its own little shed with a bunch of other machines.) Pull in an asteroid and start mining! It should be pretty intuitive. In fact, it's so simple that you don't even have to click on anything. You can mine rocks by just walking into them with your tool of choice in your active hand. When it comes to ores your current tool has trouble breaking, it usually doesn't hurt to try again a few times in case you get lucky. Concussive charges are your best friend for dealing with rocks you can't even dent. Heck, you can even ignore some of them for the time being. You won't miss out, because there's a good chance they'll appear a few asteroids later, when you (hopefully) have better, stronger equipment. Once you're done breaking up all the ore you want, gather it up by walking over it with an ore scoop with satchel. If you've outfitted a Space Pod with an ore scoop, you can simply fly over ores to collect them and then click-drag the pod's sprite onto a tile to deposit them somewhere. With an mineral accumulator, it's even easier. 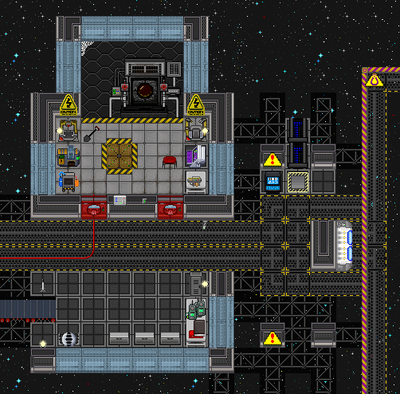 Simply pull into the middle of an asteroid, set the machine to the mineral magnet telepad, turn it on, and watch as the ore is magically sucked into and teleported into your refinery. If you're in a pod, use the remote control to interface with the magnet directly. You can only pull in asteroids so often, unless you enable the override. There is also an automatic mode, which (if there aren't any obstructions) activates the magnet as soon as the cooldown has finished. Beware: uncollected ore is lost in the process! Maintenance is required at regular intervals - simply use a welding tool on the mineral magnet to repair minor damage. In case of severe structural damage, the wiring has to be replaced with a cable coil first. If it has suffered catastrophic damage, replacement parts are required to build a new magnet by using the existing chassis. Along the way, you might want to try out the quantum telescope, a nifty little computer that can find especially mineral-rich asteroids, including erebite and miracle matter asteroids! However, it takes a fair bit of time to find and pinpoint said asteroids, so you might want to delegate one miner towards telescope work while the other ones stick to the regular magnet. 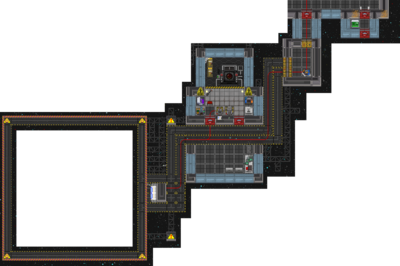 If you're on Oshan Laboratory, you'll be kicking it old school by exploring a whole another Z-level, the Trench for ores and minerals. It's dark, hot, full of angry robots and mines, and easy to get lost in, but if you find your way, great bounties and wonders await. A diving suit. The suit alone is enough protect you from the Trench's heat, though you might appreciate the extra light from the helmet. You can keep your backpack on this time around. As for footwear, you have a choice between magboots for less knockback when moving in and out of the water and flippers for faster movement speed underwater. Most people prefer the latter. Don't forget to put on a breath mask too and click on the Toggle tank valve icon on the top left so you can breathe in the air from your tank. You'd be surprised how new miners have died from not knowing how to turn on internals. Other essential equipment include ore satchels, an ore scoop, concussive charges, a geological scanner and a powered pickaxe. A Space GPS or two can be very useful - you will be able to locate many traders and other underwater structures that contain their own GPS devices, each with a unique identifier. You can take whichever of these you will need and put them in your pockets or the mining belt. It's also a good idea to claim a mining minisub. 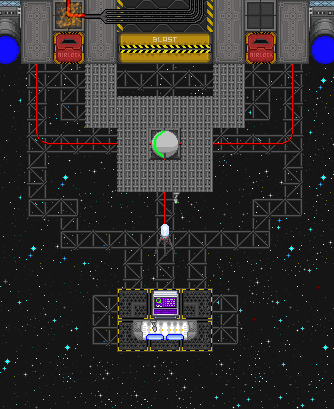 Though its starting Mining Phaser System digs slowly, it weakens rock and ore, so you can collect ores that normally require a power hammer or better with a humble power pick. Outfit it with better sensors to all the ore around you and ore scoop for excellent (300 stacks/pieces!) 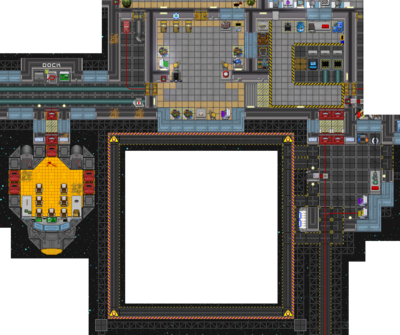 ore storage capacity, and you have quite a remarkable little ship. Not to mention, if you get lost or stuck in a bad situation in the Trench, you can just warp out! All set? Good. Go ahead and make your way to the Trench. If you're feeling brave, you could drive a minisub or simply walk into the deep hole northwest of your department. (The latter is surprisingly survivable.) Or you can make a drive/trek a little bit north and hitch a ride on the Sea Elevator. Once you're there, just start mining! Break up rock with your power pick/concussive charges, pick up ores and gems with your ore scoop, haul them back to the Mining Department, refine them into better gear, the usual. On occasion, the Engineers may ask you to mine out certain hotspots so they can boost geothermal power generation. It's very simple. Wherever the Engineer says the hotspot is according to the GPS unit, go to its corresponding location in the Trench and mine out as much hotspot rock as you can there. For instance, if a Engineer says to mine out a hotspot at (89, 201), you've to go to wherever (89,201) is in the Trench and excavate all the rock under the hotspot. You'll know the rock's under the hotspot if it releases sparks when you break it. The only difficulty is actually getting there. If you're having trouble, try focusing on one axis/direction at a time. There's also usually a fair bit of hotspot rock, so you might be there for a while. Sturdy Metal, High Energy Conductor?! Help! For a description of advanced mining equipment and the various ore classifications, check out Guide to Mining. 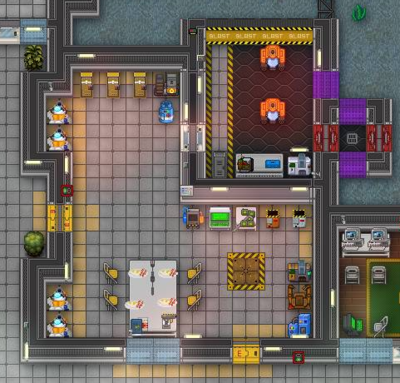 If the warmth and affection of your fellow station crew isn't enough to motivate you, miners have some other incentives to do their dirty work. Using your ID card on a barcode printer will add your bank account information to any barcodes printed. A crate marked this way that ships from the cargo bay will split the sale profits with you, directly depositing to your account. The quartermasters themselves can occasionally get their hands on stuff that is useful to you, and generally look for a fair trade. Special ores are required for a lot of higher-end gear and constructions. Cool pod equipment and custom alloys are some of the best stuff you can get through the work of miners. Miners are also in a good position to go on salvaging missions in deep space, finding cool loot and making money in more dangerous, but also more exciting conditions. You want one for yourself anyway, so if you're of a mind to complete this objective, just get some more uqill and run the fabricators. 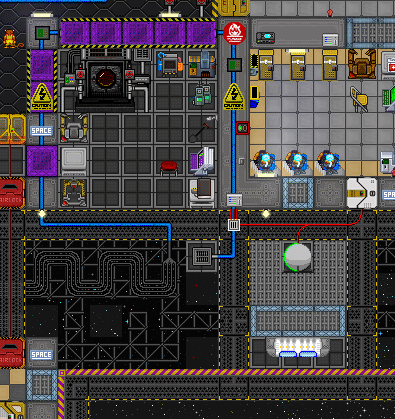 By default, a miner has access to EVA gear and top-quality internals, a remote area to spawn their items, and the ability to manufacture toys that the rest of the station does not easily get. Miners often have access to other identities, whether due to their colleagues spawning brain dead or by a quick murder of a co-worker out in the unforgiving void of space. Use your cool gear for hit-and-run style attacks on the station, retreating into the depths of space before sec can nab you. The miner also has access to a special mining charge hacker. It turns regular mining charges from concussive to explosive and allows you to stick them onto anything (walls, floors, etc.) Mining charges are cheap to produce and you can carry several on your belt at once, so you do the math. A little bit of regular mining work will pay off as well. The mechanical boots will let you avoid security and vigilantes in space, and an industrial armor set will let you safely blow things up at point-blank range. A well-equipped mining traitor is basically an one-man nuke ops team. Make sure to gloat as you hold the station at your mercy. This page was last modified on 6 April 2019, at 22:53.